The Rosh Hoshanah Blitz did not disappoint. If you like bluefish, that is. Sept. 15, 2015: It’s in all the literature. You don’t have to take my word for it. You can look it up. Fact is, the Jewish New Year traditionally is the best fishing days of the early fall surfcasting season. The dates vary from year to year. But whether September or October, I always try to be on the beach, anticipating the time-honored Rosh Hoshana Blitz. A blitz, for those of you new to this space, occurs when a school of game fish feeds voraciously on a hapless pod of smaller bait fish, creating a tumultuous boil in the water. If the blitz happens near enough to shore for a cast to reach, it makes for a high holy day of surfcasting. In my lifetime, there have been numerous such Rosh Hoshana blitzes. September and October, after all, are prime surfcasting months. I’ve had big fish, little fish–and sometimes NO fish. Over the long haul, however, I’ve mostly prospered sweetly on Rosh Hoshana. 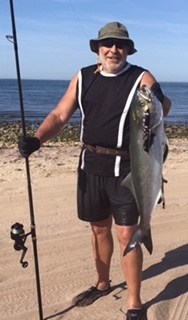 When Rosh Hoshana fishing is good, it is very, very good–bluefish, stripers, and even weakfish in the mix in some past years. And a Rosh Hoshana Blitz often foretells a good surfcasting season ahead. STRIPER BLITZ: What we hope for to produce the High Holy Days of surfcasting. This year, the weather was more summery than fall-like as 5776 came earlyish. So the cold water loving striped bass were not to be found. 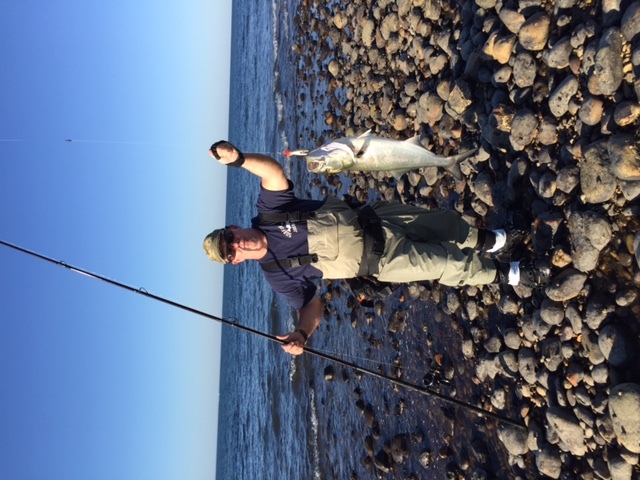 But hungry slobs of gorilla bluefish were prowling the northside beaches of Montauk. I prayed for a strong bite to feed my smoker. AMAZING RANDY: Sharpshooting a gangster bluefish in a placid sea. On the last ebb tide Rosh Hoshana, I was blessed by the fish gods. It didn’t hurt that I fished the beach with “Amazing” Randy T., a veritable “rabbi” of surfcasting, capable of putting deaf, blind and crippled people into fish. 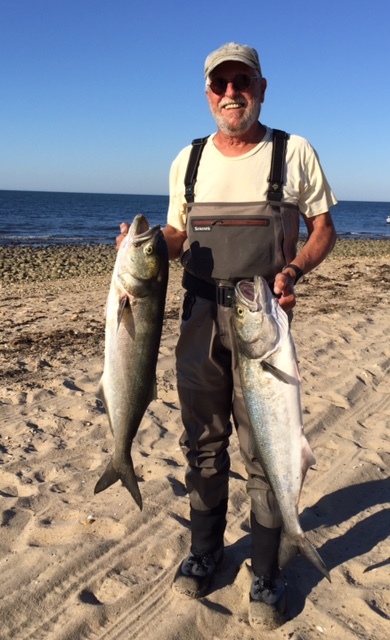 Between the hours of 3pm and 6pm, Randy hooked about a dozen gloriously theatrical bluefish. They burst through the water’s placid surface, whacking his lure with violent gulps and urgent tail splashes, the white water spray of their lunges contrasting dramatically with the deep blue water and the cloudless azure sky Randy kept a small handful of his catch–including one amazing musclehead that weighed 15 pounds and measured 36 inches. The others ranged from 8 to 12 pounds. Each fish ran and fought and tail danced in their struggle to be free. And some managed to get away. I landed three fish, dropped as many, and raised a half dozen others. Most of these fish attacked us at the end of long casts, so we were as happy for the showy performance of missed strikes as we were for the arm wrenching hook ups. Hauling in gorilla blues that work the tide and the current over 100 yards is a great upper and lower body workout. But it gets old fast after an hour or more. Even in a calm sea, these bigg’uns let you know you were in a fight (click for the video courtesy of Lou Barba). ROSH HOSHANA EBB TIDE: The amazing one nailed bluefish up to 15 pounds. I’ve been fishing Montauk for a couple of decades. And I always learn something new from the sharpies I meet there. Randy, for example, works a pencil popper lure unconventionally. 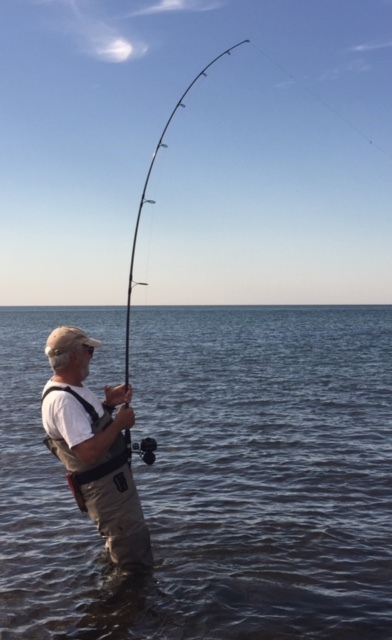 Most anglers here hold their rod almost perpendicular to the water and wag the tip convulsively with a hand high up about the reel to give the lure its action. Randy however, keeps his rod and hands low. “This way,” he schooled me, “when the fish strikes, I can easily raise my rod tip to set the hook.” Made sense. I tried it. It worked. Minutes before sunset, the action died when the tide went slack. We returned the next day for a repeat performance, but it was not to be. I was lucky enough to nail one of only five fish I saw caught all afternoon. Conditions were even more summerlike than the previous day, with nary a rip or current or breeze. Returning yet again, this time with jet-lagged big brother in tow, the action picked up again and Randy and I had another handful of fish to our credit. Just a little bit of wind at our backs, enough to stir the water and create the rip that the fish crave, made all the difference on day 3. 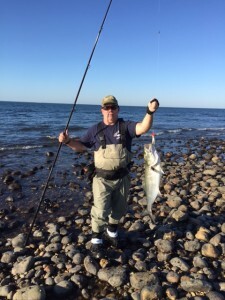 BLUES ON BOARD: Choppers and gorilla blues start the New surfcasting year right. All our action took place at the North Bar, just around the corner, west of the Montauk Lighthouse. SWEET CATCH: Bluefish for Jimmy Meeks on the high holy days of surfcasting. Fishing in bathing shorts and water shoes is a September treat that doesn’t last long. But with the cooler temperatures will come even better fishing. Perhaps the weather front predicted for the upcoming weekend will wake up the stripers in time for the next key calendar date: the lesser known but up and coming Yom Kippur Blitz. After all, what is written on Rosh Hoshanah, is sealed on Yom Kippur. Nu? L’shanah Tovah! This entry was posted on Friday, September 18th, 2015 at 4:06 am and is filed under Uncategorized. You can follow any responses to this entry through the RSS 2.0 feed. You can leave a response, or trackback from your own site. Vinny–If the fish are here when you are, you’ll do fine. Just don’t try to reason with them. It is not that the fish won’t listen–they just won’t understand you. None of us do!